Planning our honeymoon wasn't as easy as we thought it would be. We both wanted to go somewhere that neither of us had been... someplace warm... someplace quiet... with a beach where we could just relax and unwind from the stress of the wedding. Bora Bora was at the top of our list and we wanted to stay in an over water bungalow. But the reality of the expense hit us. Strike one! There was no way we could afford to spend a week there. After talking to my travel agent friend, she suggested Fiji. She said it was similar in beauty, a bit off the beaten path, and less expensive. She gathered some information on resorts while we looked more into the islands themselves. The pictures sold us! Crystal clear waters, white sand beaches, palm trees galore, and the soft coral capital of the world...we were ready to go that instant! Sadly, we still had to wait 10 months. The initial resort we booked was suddenly sold and the owner e-mailed 5 months before our departure to inform us that the new owners were probably not going to continue to be in the honeymoon business and felt we would be better off at another resort. Strike two! I spoke to my travel agent friend again and one of her friends had recently returned from Fiji, stayed at Vatulele Island Resort (the only resort on the island), and could not stop talking about it. We, again, did some research, read the reviews, and were once again eager to hop on the plane. We hopped on the red eye on November 8th for a 10 1/2 hour flight to Nadi. 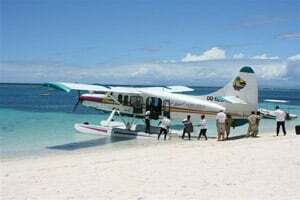 Upon landing on the main island in the early morning of the 10th, we were greeted with a shell lei and soon boarded our seaplane to Vatulele Island. The seaplane was an experience all to itself. Neither of us had ever flown on a seaplane and we were looking forward to landing on the water. The short flight was amazing! The views of the lush green island below, the deep blue ocean, and sunshine ahead toward our destination made us giddy like little school kids. On approach, we noticed the clear water, the thick rain forest, the white sand beach, and we couldn't help but catch a glimpse of each other smiling in anticipation. The water landing was surprisingly smoother than we expected. When we climbed out of the small plane, the staff was on the sand, singing a joyful welcome song in their native language. They introduced themselves, we gave our names, and they gave us a refreshing cold towel and glass of champagne. We met our host in the grand dining bure, a beautiful open walled hut with amazing wood beam details, soaring thatch covered roof, and a welcoming bar. She walked us to our bure through the lush tropical forest and informed us that we were staying in one of the refurbished bures. Maybe our bad honeymoon luck was finally behind us. When we walked down our secluded walkway, we could see our bure and caught a glimpse of our private plunge pool, one of only four bures that had been upgraded with a plunge pool. Our host walked us through our amazing bure which was beautifully decorated and adorned fresh picked flowers throughout. It contained a large bathroom, a sitting room, a king-sized bed in the elevated sleeping area, private dressing area, and an expansive deck complete with outdoor shower and hammock, ideal for lazy afternoons. Perfect... absolutely perfect we thought. Shortly after, a chilled bottle of champagne was delivered to our room and we celebrated the start of our long-awaited honeymoon. Our week was spent laying out by our private plunge pool, kayaking around the reefs, exploring the beach and tropical forest, scuba diving, snorkeling, talking with other guests and the friendly staff, joining in on some of the daily activities the staff would arrange, taking in the nightly picturesque sunsets, and enjoying the succulent local fare that Chef Stuart and his staff prepared daily. 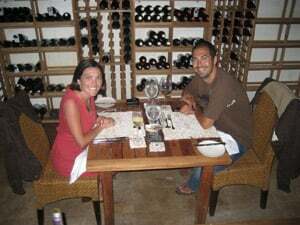 We enjoyed a romantic dinner on the beach under candle light one night and another romantic dinner in the resort's wine cellar. One afternoon, the staff packed up a picnic lunch and took just the two of us to a private island, called Nooki Nooki Island, a short boat ride away. They set up our lunch and asked when they should return to pick us up. We told them 3 1/2 hours, but should have told them later. We spent the time in total seclusion, except for the multitude of hermit crabs living on the island, enjoying our lunch, snorkeling, and just enjoying each others company. One aspect of the trip that continually amazed us was how genuinely friendly the staff was. All we had to do was tell them our names once, and from then on they called us by name and knew which bure we were staying in. If we missed lunch one day, they would pay us a visit in our bure to see if they could bring us anything. The staff made this resort so welcoming that we felt like family, not just another couple on our honeymoon. They made sure to leave fresh picked flowers in our bure daily, which my wife greatly appreciated. Our final half day at Vatulele, November 17th, was a sad one. We were not looking forward to returning to Los Angeles after such an amazing trip. The saddest part was just before we boarded the seaplane as the staff that gathered sang a sad farewell song...much less upbeat than the welcome song we enjoyed just a week earlier. 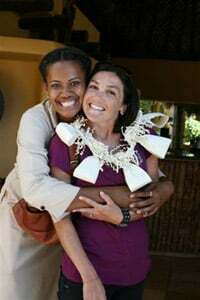 They gave us hugs and placed a handmade tapa cloth lei around our necks as a souvenir. Shortly after, as our seaplane accelerated and skied across the water in front of the resort, we felt a sense of calm knowing that we just enjoyed a week in paradise. The plane circled around and performed a low fly by while the staff waved to us. We enjoyed every aspect of the trip, that it's hard to say what our favorite was. Was it kayak surfing through the small waves out by the reef? The Fijian cultural night where we experienced local song and dance and even joined in dancing and drinking kava with the locals? The village trip where we met the Paramount Chief of the island, interacted with the locals, and played with the friendly children? Exploring an under water world rich with corals, abundant sea life of all sizes, and a color so blue we feel we will never see anything like it again? Or was it just our lazy days spent in seclusion in our bure, enjoying the privacy of our plunge pool? To be honest, I think our favorite part of the honeymoon was the entire honeymoon itself. Finally, after two early strikes, we hit a home run! Unfortunately, there were no job openings at the resort while we were at Vatulele Resort so we couldn't stay forever. We know that someday we will have to return, possibly for a milestone anniversary. But in the mean time, we have been recommending Vatulele Resort to all our friends and family, and hope someone will follow our advice so that we can live vicariously through them. The entire trip cost a total of about $7,400, which includes the flight, daily excursions, and all food and drinks. The scuba diving was extra but was surprisingly reasonable. Although $7,400 was on the high side for us, registering with Traveler's Joy helped make it affordable and allowed us to live in paradise, albeit for too short of time. The memories and pictures we have will remain with us forever and serve as a reminder that a return trip must occur... hopefully sooner, rather than later.